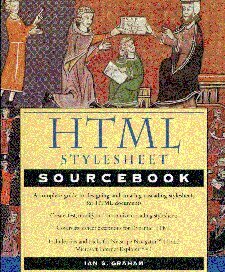 Description of Contents of "The HTML Stylesheet Sourcebook"
The book consists of nine chapters and two appendices. The first two chapters are introductory. Chapter 1 is a simple introduction to the concept of stylesheets, and uses examples to illustrate the CSS approach. Chapter two contains an overview of HTML -- every CSS designer must understand the rules of HTML, in order to understand the application of CSS to HTML documents. Chapters three through six form a four-part tutorial on of CSS. Chapter seven follows this up with complex CSS formatting examples, complete with explanations and detailed descriptions. These examples illustrate advanced CSS design issues. The next chapter (eight) is a detailed CSS reference, and describes the CSS syntax and all the CSS properties. Chapter nine concludes with a description of new non-standard CSS features, such as absolute positioning of content and font downloading. These new features are already being implemented in Netscape Navigator 4 and Internet Explorer 4. Finally, Appendix A described problems and issues related to using color in Web pages (and in CSS), while Appendix B describes length measurements as defined in CSS. Review of appropriate HTML markup design; five example CSS stylesheets, with the designs described in detail. Detailed description of CSS language syntax, and of every CSS property. This is a reference chapter. CSS positioning; scripted documents and the Document Object Model; Font downloading and dynamic fonts; aural stylesheets; printing and other presentation media; list of available CSS-aware software (a more current list is available at this Web site. Description of important color issues; CSS color notation; CSS named colors; standardized RGB color representations (sRGB).